The testimonials given below are reproduced faithfully from the originals received. If you would like more information about any of them please feel free to contact me. 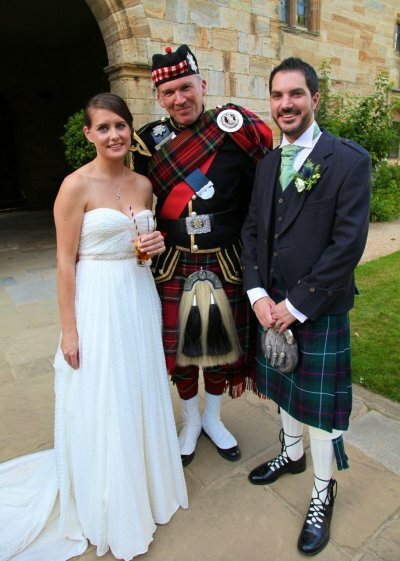 "I just wanted to say a massive thank you for playing the bagpipes at our wedding at Ashdown Park. Everybody absolutely loved the music and also commented on what a lovely man you were!" "Some of the photos taken were fantastic and you made peoples day when they got to wear the rather large headpiece!" OH. MY. GOD.!!!!!!!!!!!!!!!!!!!! Thank you so so very very much for everything you did for us on Saturday. I really mean it when I say that you really did make our day perfect, and I can't thank you enough. SO many people have asked for your number so, if its ok with you, I'll pass it on?? I owe you big time - thank you. 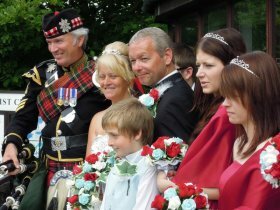 We would like to thank you once again for playing the bag pipes at our wedding on the 1st December 2007. 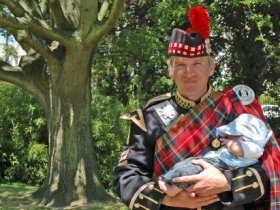 We had a great day, seeing our friends and family and through your contribution of playing the pipes your music and presence made it all the more memorable. We will never forget arriving at the Church to be greeted by you playing the pipes it sounded fantastic and it is a memory we will never forget. 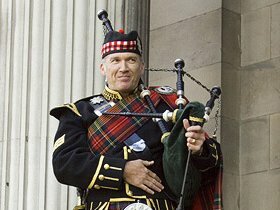 Many people commented they wish they had thought of a bagpipe player, and how smart your uniform looked. It all added to our special day, which is just what we wanted to achieve. Finally, we know it was short notice on the day as we were worried because the toast master had let us down on the day, but you did a great job stepping in, we wish we had just taken you up on the offer in the first place to welcome the guests at the reception and introducing the speeches. 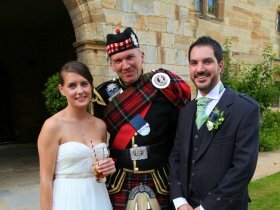 We will send you some pictures of our special day so you can add them to your portfolio.